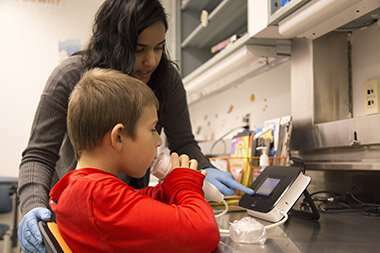 The prevalence of children with asthma and allergies has increased over the past two decades, and although genetics may play a role, previous studies have suggested that other factors – such as maternal obesity or exposure to "extremely sterile" environments, such as in the case of cesarean deliveries – could also be to blame. In a new study published in the American Journal of Epidemiology, Bell and graduate student Temilayo Adeyeye led a team to research this phenomenon and found that delivery method is indeed a factor in a child's development of asthma or food allergies. The researchers analyzed 6,157 infants born to 5,034 mothers in New York, excluding New York City, by compiling data from New York State vital records and questionnaires completed by the mothers. Respiratory conditions and allergy data were collected on the babies at 4, 8, 12, 24, 30 and 36 months postpartum. The authors observed that infants delivered via cesarean section were at a more than two-fold higher risk of both food allergy and asthma from birth through 36-months of age, compared to those who were delivered vaginally. The babies born via cesarean section were more likely to be delivered by mothers who were older than 30 years and who were overweight or obese prior to pregnancy. Additionally, vaginal delivery infants were more likely to be breastfed in the first year of life compared to cesarean delivered babies. The research was part of the larger Upstate KIDS Study, which tracks the ongoing growth, motor and social development of more than 6,000 babies born to 5,000 mothers between 2008 and 2010 in the 57 counties of upstate New York. 0 Response to "Link found between delivery method and asthma, allergies - Medical Xpress"